As I've been following a slow carb diet, one of the best features is that I don't have the junk food cravings that I always used to get. That is thanks to how satisfying and full a strict slow carb meal will leave you. A typical slow carb meal will keep you fueled up for several hours and up to your next slow carb meal. However, it's not always easy or convenient to keep every meal a slow carb one. Maybe you forgot your slow carb lunch at home and you have to buy your lunch while at work. As a result, hunger inevitably will hit you and you won't be able to cook a chicken breast or scramble some eggs to fill you up. You need something else. In these situations, you want to have a snack that isn't going to break any slow carb rules, and so it will pay to have some slow carb snacks handy. If you're at home and have your kitchen available to you, check out this idea for a quick slow carb snack. However, for those times when you're not home, you need to be prepared. Here's a recipe that you can make ahead of time and leave at work for those times when you need to snack. It's a recipe that I have created: Roasted Black Beans! Preheat your oven to 400 degrees. Find a large baking tray and either spray it with cooking spray, or cover it with a layer of parchment paper. Open a can of black beans into a strainer and rinse well with cold water, then drain. Transfer the dried beans to a large bowl. Drizzle a bit of olive oil over the beans. Season the beans well with the cumin, paprika, chili powder, and salt. It's up to you how much seasoning you want to add! Squeeze the juice of half a lime on to the spiced bean mixture. 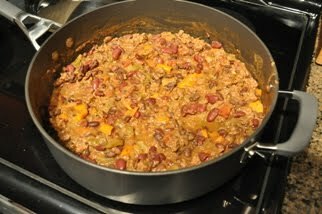 Mix the beans and spice mixture well until everything is evenly coated. Distribute the beans on to your baking tray, and spread them out into a single layer. Cook at 400 degrees for about 10 minutes, then remove them and stir them around a bit. Put them back in and repeat the process until the beans are dried and crunchy. This will probably take you 30-40 minutes. Allow them to cool, and enjoy! You can pack them into a ziplock bag and stash them at work for later. I find that I have to add more seasoning than I think for it to taste really good. This especially applies to the salt, though you don't want to go overboard with it. Also, for more of the lime flavor, you can use the juice of a whole lime or more, rather than the half that I used above. I created this recipe on my own, so I'm really looking for some feedback on it. Please try it and tell me what you think! I think I will try this recipe this weekend. Glad I found this blog. Thanks. Making them now but no paprika or cumin in the house so I used Lowrey's. Will let you know in 30 minutes! OMG! These are awesome!!! What a great snack for when I don't have time for lunch. Thank you so much for posting this recipe! These were so good. I used 1 whole lime because I love the them and I could have eaten the whole batch in one sitting. I am always looking for ideas to leave at work because I forget my lunch all the time. I sprinkled sea salt on top when they were on the sheet instead of mixing it in.